Bayarban Program (CLASS Bayarban): On 29th Feb 2016 we visited in CLASS Bayarban. We did meeting with parents. We gave information about our program and support. They were happy with our support. We discussed general situation of their daily life also. We Hand over First aid box to LSA. There are 25 children are studying by our support. 23 parents and 25 students are involved in the program. Birtamod Program (CLASS Birtamod): On 1st March 2016 we visited in CLASS Birtamod. We did meeting with Parents and student. There are 50 children studying through our support. They know very well about our program and snacks system. Same time did meeting with school management, Teacher, Head master and CRO of Jhapa, Mrs Laxmi Kandel. They are very positive about our program. Jhapa Program (CLASS Jhapa): On 2nd March 2016 we organized we went CLASS Jhapa (Tagandubba). We meet with children and take their photo. There are 50 students. They are studying in 4 different surrounding schools. We did meeting with School head master in Swasthani Primary School. In this school 33 children are studying. In Janata Higher Secondary School, there are 12 children, Bhirkuti Lower Secondary School in 2 children and Believers School 3. CLASS Koshi Haraincha and Belbari: On 3rd March 2016 we visited 2 CLASS center CLASS Koshi Haraincha and CLASS Belbari. We did meeting with parents, School management and children. We hand over first aid box of those CLASS center. Our Nurse Miss provided health awareness class to parents and children. Same day we visited our ORCHID office. We did meeting with staffs about program effectiveness. 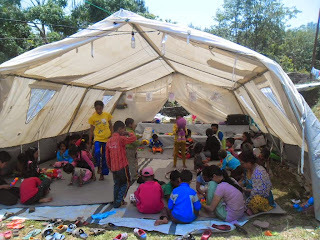 In Koshi Haraincha there are 50 children and in Belbari there are 25 children studying through our support.